Antique - Tuscan/Royal Tuscan China - Pattern #8357 - Made in the 1920"s - Total of (15) Pieces. 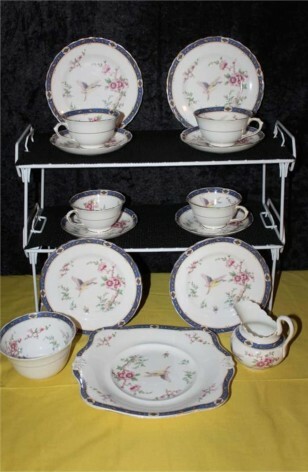 Beautiful Antique Art Deco Tea Set, Pattern #8357 by Tuscan/Royal Tuscan China in England. This is a lovely Floral and Bird Pattern, surrounded by Blue Band and 22kt Gold Scrolls in the Band. Floral is in shades of Pink on Tree like Stem with Duck in Flight. Pattern has a similar feel as the Indian Tree by another manufacturer. Lots of 22k Gold Trim on Rims. 4 - Bread/Dessert/Tea Plates - 7"